This glass-bedecked, 36,200 square feet complex, designed by Brandstetter Carroll Inc., Lexington, and constructed by D.W. Wilburn Inc., Lexington and Somerset, gives the east side of downtown an ultramodern look. It sits where once was a cluster of historic but almost dilapidated structures. Meece Hardware building at 302 East Mt. Vernon Street had been there since 1941. Before the hardware store, it housed an A & P store and then Dollar General. An adjoining building, build in 1945. was originally Ben Mattingly Tire Store then Shamrock Glass. The old buildings were razed to make way for the Energy Center. The Energy Center is a one-of-a-kind in the state and nation, is a technological marvel monitoring Somerset’s widespread natural gas pipeline network and providing space for a new city hall. Somerset made a major step into the natural gas business during a shortage in the 1970s. The city borrowed $4.5 million from Farmers Home Administration and built a natural gas pipeline into eastern Kentucky. Transmission of natural gas from previously landlocked producers ended frequent shortages in Somerset during severely cold weather. 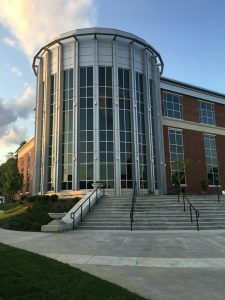 A wing of the Energy Center will be named for the late Milton Beattie, city engineer for Somerset Gas Service, who engineered the natural gas pipeline to Eastern Kentucky, and Joe Ball, area community development specialist for the University of Kentucky College of Agriculture, who assisted with the original natural gas project. Somerset has a bountiful supply of natural gas. A pipeline extending westward to a Texas Eastern Transmission Corporation terminal in Casey County also has a connection with two other national pipeline networks. Somerset’s pipeline network in Eastern Kentucky collects natural gas from 20 producers with about 1,000 wells, and raw natural gas is made pipeline ready at a processing plant at Gabbard Fork in Clay County. Natural gas not used by Somerset customers is sold to national transmission firms, and byproducts are separated and sold. The Energy Center’s technological monitoring system which uses solar power in places where electricity is not available, will be able to turn valves off and on and direct flows of natural gas with the assistance of Satellite technology. The heartbeat of the technological marvel is four wide-screen monitors, observed around-the-clock, seven days a week. The monitors show flow, pressure, direction and the volume of natural gas in the city’s natural gas pipelines in and around Hyden in Eastern Kentucky and in nationwide pipeline terminals in Casey County at the west. Monitors pinpoint critical spots. Plush city hall space in the new Energy Center will replace the existing, crowded city hall building used since 1951. Nominated in the past for the National Register of Historic Places, the Art Deco­ style building was constructed for an automotive repair shop in 1930 by W.C. “Leggs” Norfleet who was mayor of Somerset between 1922 and 1946. All the city’s financial business, utilities, engineering and police departments will be consolidated under one roof when Somerset Energy Center is fully operational. Somerset’s visionary Mayor, Eddie Girdler, believes that energy-related businesses are the key to downtown revitalization, which has been a goal since businesses migrated from downtown Somerset to U.S. Highway 27 during the 1960s. Since future plans include an elevated causeway from the third floor of the energy center, west to a widened North Central Avenue. Girdler envisions energy-related businesses along the improved street tied to the Energy Center by the walkway. “This building represents all of us coming together,” commented emcee John Alexander, a safety officer and public relations specialist for the city. The Energy Center fits perfectly with Shaping Our Appalachian Region (SOAR), an initiative aimed at improving the economy of Eastern Kentucky. SOAR was started and promoted by Rogers and former Gov. Steve Beshear. Initially, plans were to tear down the existing city hall and adjacent Utilities Building to the north and make a parking lot. Later, Mayor Girdler said there was plenty of parking at the rear of the Energy Center and hopefully the to-be-vacated city properties can be sold.